This year, the Volkswagen Tiguan rolls into our Orlando dealership with exceptional enhancements that are sure to grab attention. Featuring heated front seats, premium vinyl upholstery and keyless ignition and entry - this SUV is just what you've been looking for! Read our full review below to learn more about all the fantastic features that this SUV has to offer! Inside, the VW Tiguan in Orlando offers drivers a commanding view of the road with its tall seating position. 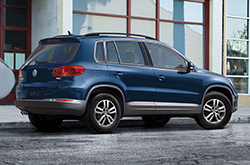 Tiguan reviews say this gives drivers an advantage when it comes to parking. On top of that, it delivers awesome acceleration, thanks to its 200 horsepower, turbocharged four-cylinder engine. With one press of the pedal, you'll be on your way in no time, so it's no wonder why reviews say the Volkswagen Tiguan produces "energetic acceleration that's among the quickest in the segment." Front wheel drive and a six-speed automatic transmission are standard, while the all-wheel drive configuration is optional. Aside from its athletic engine, the Tiguan is well-equipped even at the entry-level S model, which includes keyless ignition and entry, cruise control, air-conditioning, heated front seats and more. On the entertainment end, this trim gets an eight-speaker sound system with a CD Player, a 5-inch touchscreen and Bluetooth phone and audio connectivity (standard). The R-Line trim adds foglights and a 6.3-inch touchscreen. Plus, it gets power driver and passenger seat adjustments for extra comfort. Continuing the list of luxury equipment is the 19-inch wheels that are sure to turn heads, along with the sport steering wheel with transmission paddle shifters. SE and SEL models exude elegance with LED running lights, a panoramic sunroof and a navigation system, while the top-of-the-line SEL trim gets an eight-speaker Fender audio system, leather upholstery and more. As for safety equipment, the Tiguan is well-equipped with standard features like full-length side curtain airbags, front side airbags, traction and stability control, antilock disc brakes and a rearview camera. Visit us at David Maus Volkswagen to learn more about the 2016 Volkswagen Tiguan, or keep reading the rest of our Tiguan review to find out more about specs and features, as well as a third-party comparison tool. 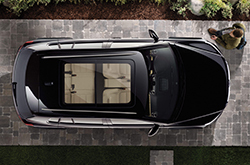 We're absolutely sure that the Tiguan is ideally suited for you. 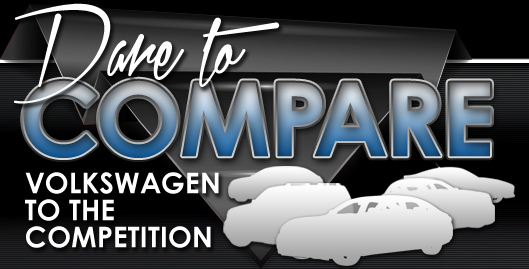 That's why we would like you to compare Volkswagen's newest model alongside the 2016 Chevrolet Equinox, Honda CR-V and the Toyota RAV4. Shoppers will be pleased with the Tiguan's splendid exterior design, as well as its user-friendly cabin features. When compared to the vehicles listed above, in terms of price it's clearly a truly outstanding value, making it a first choice among Volkswagen customers in Orlando. View our bullets for more information about what it offers! 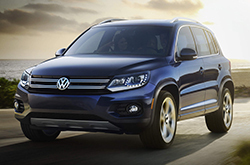 Do you want to know more about the 2016 Volkswagen Tiguan's features and specs? After reading the review above, visit David Maus Volkswagen South and experience the Tiguan up close. Not all Orlando car franchises are alike. We differ from others in that we feel it's our mission to provide customers with quality reviews. Filled with invaluable information and specs, including mpg and other info, each overview gives you full access to everything Volkswagen's lineup has to offer. Learn more about our amazing series of vehicles; visit the research directory to review and compare other models offered by David Maus Volkswagen South now!